The HS-910 is a corded headset with boom microphone. 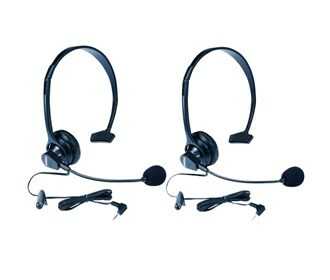 The headset is designed for contact center use, and delivers great performance and exceptional value. This device allows you to talk hands-free while you work. Its boom-style microphone adjusts easily to fit multiple users. The HS-910 has a 2.5mm jack which makes it comapatible with most headset-ready phone models. It comes with comfortable headband wearing style combined with a lightweight design. The Uniden HS-910 For VTech Phones has many exciting features for users of all types. It's one of FactoryOutletStore's best selling . You can extend the lifetime of your Uniden HS-910 For VTech Phones with the purchase of a FactoryOutletStore Factory Protection Plan. The Uniden HS-910 For VTech Phones is sold as a Brand New Unopened Item.